Rinse the courgettes in cold water, then dry. Grate coarsely and place in a sieve with the salt to drain. Peel and finely chop the onion and garlic. Heat the oil in a frying pan and add the onion and garlic for 5 mins until browned. Roughly break up the goat’s cheese in a bowl. Add the well-drained courgette, followed by the onion and garlic. In another bowl, beat the eggs then add the flour and parmesan. Mix well. Add the courgette mixture and the chopped basil. Season with pepper. Pour the mixture into a greased rectangular oven dish. Bake for 45 mins. 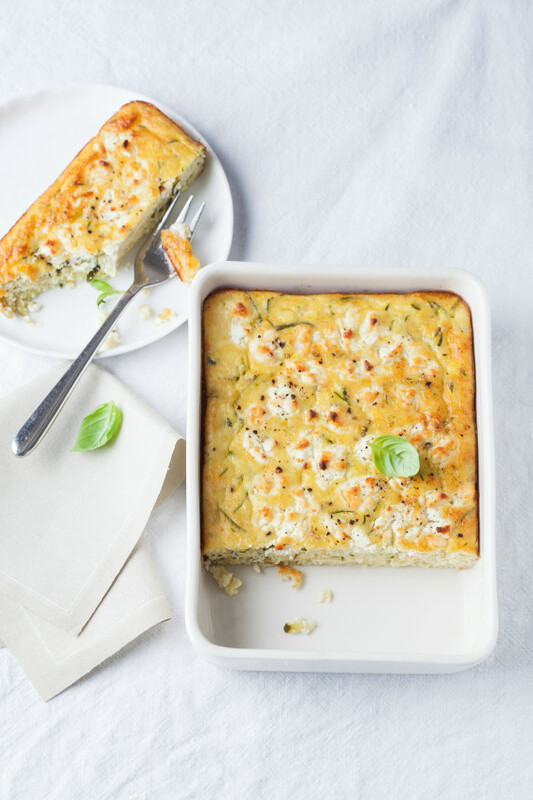 Serving suggestion: this courgette clafoutis is perfect for picnics and can be eaten hot or cold with tomato coulis. Tip: the basil can be replaced by mint.